Whatever platform you look at – iOS, OS X, Android, Windows, Linux – there is some form of software store available. Android users have been able to enjoy Google Play (under various guises) for some time, and Apple’s App Store is well known even outside of tech circles. Microsoft was a little slow to join the party, but Windows 8’s Store means everyone is now on the same page. But is the store that’s built into Windows 8 the best option? If you want to access the Windows Store, at least through an app, you need to be running Windows 8. This makes sense to some extent, but it is slightly restrictive. What about when you’re using a second computer that’s still running Windows 7? Well, in this instance you can browse through the Store online, but there are still limitations to keep in mind. The most notable limitation of the Store is that you are only able to browse through apps that have been made available in your country. You can search for apps using your favorite search engine, but this can be something of a hit and miss affair. But there are other ways you can sate your app needs. Whether you’re looking for modern apps for Windows 8, or just want a way to track down interesting software, there are plenty of ways to go about it. 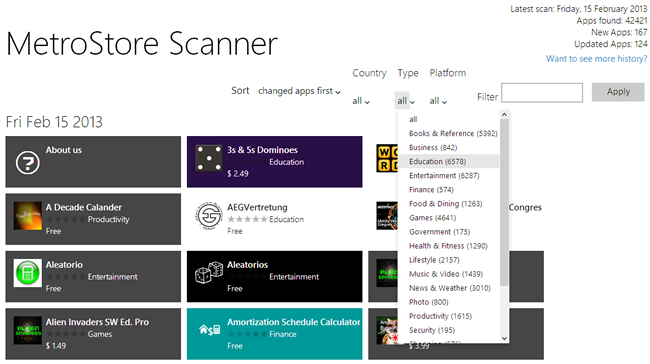 MetroScanner is a website that acts as a front end for the Store on the internet – something that Microsoft did not provide. You can search for apps just as you would with your web browser, but there are also filtering options to help you to home in on what you’re looking for. Drop down menus make it possible to limit the apps that are displayed to software that falls into a particular category, has been designed for particular platforms (32-bit, 64-bit and ARM) or is only available in specific countries. Statistic fans will be pleased to see information provided about how many new apps have been added and how many have been updated. Graphs are available to illustrate historic data. 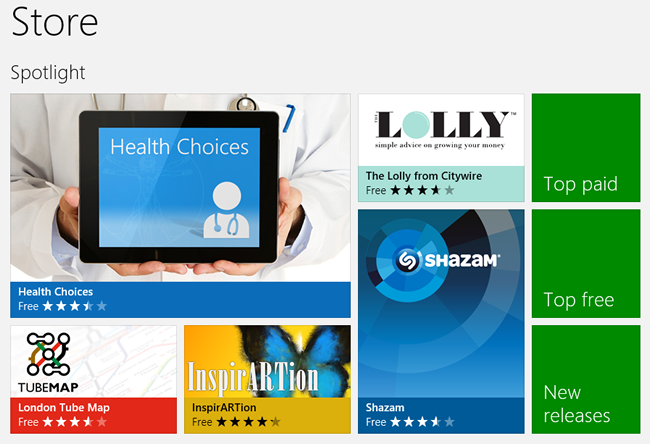 It’s not just users of Windows 8 that are able to use an app store. 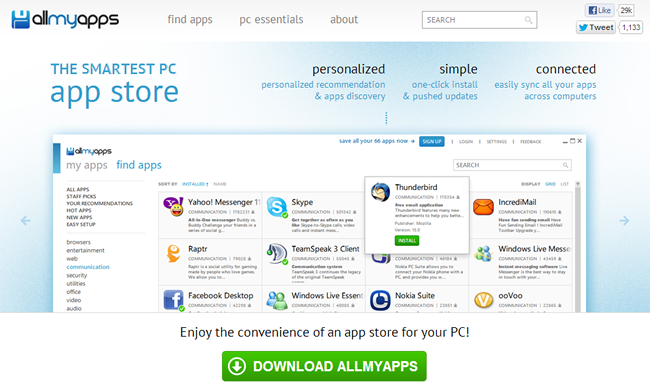 Allmyapps is available to all versions of Windows and provides access to apps that have not had to go through the usual Microsoft vetting process. You won’t find anything designed specifically for Windows 8 here, but the app serves as a great alternative to blindly hunting for apps, or relying on software download sites. As an added bonus, Allmyapps also keeps track of software updates and notifies you when there are new versions available, even if update checking is not a feature supported by a particular app. Install the program on more than one computer and you can synchronize your software between machines so you never have to worry about missing out on something you need. For all the talk of choice, the vast majority of software downloads are users grabbing installers for a fairly limited number of apps. App stores with hundreds of thousands of apps to choose from are certainly useful, but Ninite concentrates on making it easier to get your core apps set up. 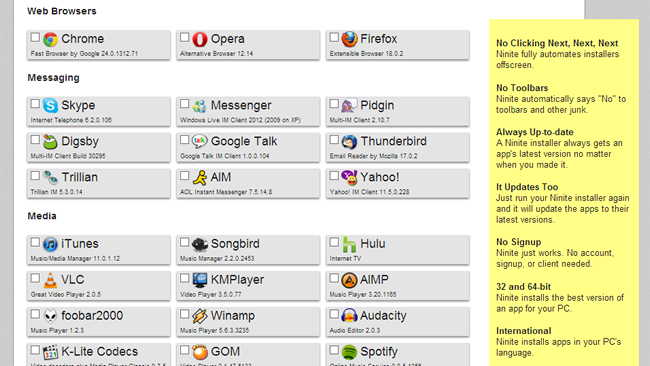 Rather than forcing you to visit countless web sites and download numerous installers for all of the software you need, Ninite enables you to select all of the apps you’re interested in and have custom installers made for you. 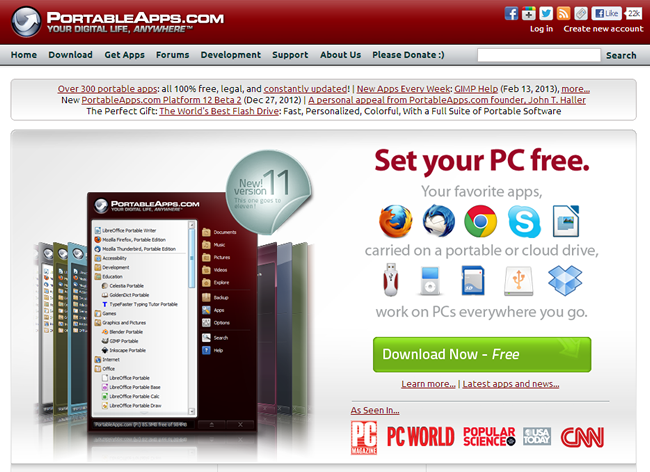 This means that you can install dozens of apps in just a few clicks, and should any of the programs you choose include bundled bloatware such as toolbars, the custom installer will automatically decline their installation. You don’t have to be running software from a USB drive to have an interest in portable software; there is a great deal to be said for programs that do not need to be installed. 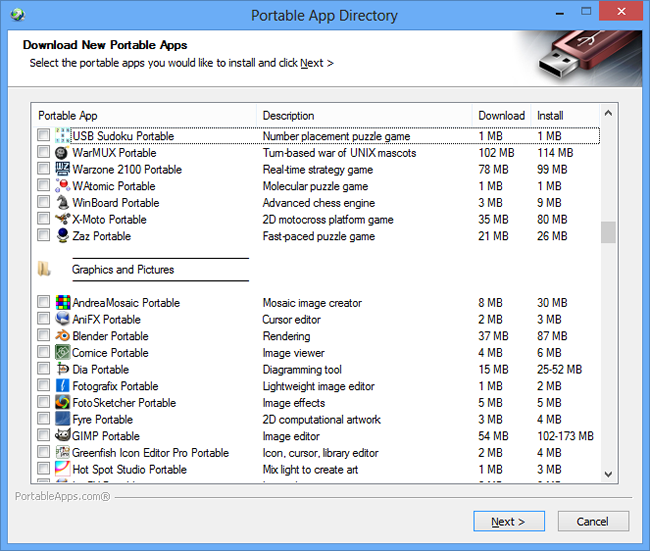 Grab yourself a copy of the PortableApps.com Platform and you can save yourself from having to hunt down portable versions of all the apps you use. Run through the installation to get the software up and running, and you will gain access to an interesting take on the traditional app store. It works like a combination of Ninite and Allmyapps, enabling you to select the apps you want to download from the directory and taking care of the rest for you. Once downloaded, you can use the supplied launcher to access the apps you have ‘installed’. What have you found to be the best source of software? Do you use the Store or are you more reliant on download sites?